Here’s a list of things that most birdwatchers bring along on birding trips. A spotting scope is simply a short, relatively powerful telescope that is specifically designed for looking at things in the medium and long distance. While a pair of binoculars will have a magnification power ranging from 8X to 15X, spotting scopes generally have magnification powers which zoom from 25X up to 40-45X. Good quality spotting scopes will cost several hundred dollars to well over a thousand dollars, depending on the type of optics and coatings desired. Some scopes will come with straight eyepieces, which require the user to look directly down the centre of the scope barrel. Others will have the eyepiece offset at a 45º angle. The latter choice is easier on your neck and back muscles if you plan on using it for long periods of time. Because they can be quite a costly item, it is recommended that novice birders try using a few different scopes before laying out a big wad of cash on their first scope. Since most stores do not rent spotting scopes, your best bet for trying out the view through different scopes is to check out the scopes used by other birders; almost every experienced birder will be more than happy to let you check out their scope if you ask them. The best way to use a spotting scope is to mount it on a tripod. There are hundreds of different types of tripods available on the market but there is one mantra which is true for all of them; the cheaper, lightweight tripods are often too flimsy and finicky for birdwatching. What you want in a good tripod is a head-mount with smooth three-way motion, solid legs that won’t wobble once they are extended to their maximum length and a handle which will allow you to easily swivel the scope when it needs to be moved but firmly lock the scope in place when that is required. The good tripods may be a bit pricey but when it’s windy outside and you’re standing on rough, un-even ground, you will be thankful that you parted with the extra money. This is a handy items to have whenever you can drive to an area which has good birdwatching possibilities visible from your parked car. A car (or minivan or SUV) is actually a very good birding blind; you can remain in the car, hidden from view, and your movements won’t be detected by the birds. A window mount will fit on the top edge of the lowered window and it has the same mounting mechanism as a tripod. So you can remain in the relative comfort and concealment of your car and still be able to use your spotting scope. The window mount can be installed or removed in just seconds. 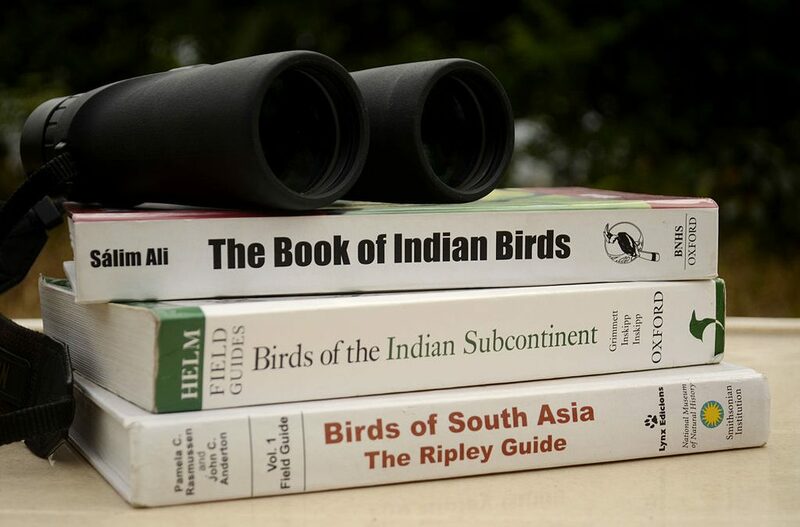 In addition to the major field guides which cover the entire nations, most birders also carry a selection of more local field guides. Almost every state or province has their own field guides, and there are often field guides which are pertinent to a specific region, such as a national park or significant birding area. These can be as simple as a piece of clean, lint-free cloth or as expensive as a manufacturer’s recommended lens cloth and cleaning fluid. Regardless of which you choose, you should carry something with which to clean the various lenses you have with you, e.g., binoculars, spotting scopes and cameras. A squeeze-bulb blower brush is also very handy for cleaning grit off lenses, so that they aren’t scratched by the sand when you wipe them with a cloth. A more powerful version of the blower brush, a can of compressed air can also remove sand and grit from optical lenses, especially for stubborn bits which have lodged themselves into corners or under edges. Also known as rubber boots, barn boots, muck boots or Wellingtons, every experienced birder owns a good pair of these handy boots. Sure, it’s possible to spend an entire day birdwatching without ever having to step off the nice paths or the sandy beach, but it’s inevitable that some really cool-looking bird will fly off across the marshy area. Being able to slip on a pair of rubber boots will greatly increase the area you can cover while still keeping your feet warm and dry. And that term, “feet warm and dry”, can mean the difference between a great day of birdwatching and a cold and miserable one.